I recently started a youtube channel and I will be posting more of the videos from that channel here in the coming weeks. Following is a lyric/translation video of the Bhagat Namdev's shabad "Karima Rahima Allah Tu Gani" in Raag Tilang. Central idea: This shabad inspires us to remember that compassion lives at the doorstep of our hearts. We often don't open the door at our heart and let this compassion come in, but it is there. It is present here and now. Importance of Rahao: Despite this being a popular shabad, I couldn't find any recordings that used the rahao tuk as the refrain. The shabad is usually sung beginning with the line "Main Andhale Ki Tek." The more I meditated on Gurbani, the more I have found that the essence of any shabad is most easily understood through the "Rahao tuk." Therefore, in my newer compositions like this, I try to adhere to the Rahao tuk as the refrain. Raag Tilang: The shabad has been sung in the traditional form of Raag Tilang. 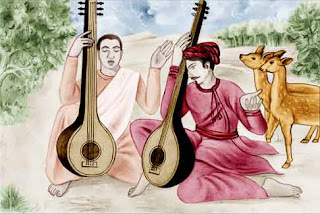 Most of Tilang compositions these days are in Mishra Tilang in which komal gandhar and several other notes are added. Taal: While one can sing this composition in Dadra, it really is a 24 beat taal with 4 cycles of 6 beats each. Repetition of long cycle taals add to the meditative aspect of any composition. Unfortunately, such long-cycle taals are becoming extinct in this day. Recording: The melodic composition of this shabad is only around 2 years old. I recorded the music on my laptop mostly during a trip to the east coast. I recorded the vocals in my home studio in Northern California. The harmony track was added by a friend, Fontain Riddle, who is an accomplished singer and songwriter from Southern California. I thought this was apt for Fontain to sing because her son's name is Karim. Fontain is married to my high school friend Farhan Khan who plays the guitar and the sitar. Very nice rendition. Thank you for sharing. I am starting to learn dilruba soon, and want to know where iI can find musical notations for the shabad in gurbani - like the above one, Sabai ghat ram, ram japo ji, ram simar ram simar etc. Music is the food of the soul and you Shivpreet-ji with your God given talent have been able to touch our inner hearts and bring us even closer to Waheguru. Your voice and the musical arrangements are outstanding and bring peace to our daily lives. May Waheguru bless you always and your friends too. This shabad has been sung by Manna Dey under title Main Andhle ki Tek. Its tune is very similar to your composition. So I believe it was allso in same raag. A great effort being done by you. Thanks for your kindness. Waheguru ang sang! Jasleen ji, Bhagat Naam did mention Allah and his synonymous names of Persian language in his compositions. Sakhis say, he was tortured by the local Muslim king to repeat the Name of Allah but Bhagat Naam Dev ji refused citing reason that he(Bhagat Naam Dev ji) had remembered Allah in his Compositions as per wishes of Lord Almighty and a king of worldly affairs cannot equal Almighty Lord.